Every week I like to roast up a big batch of veggies to get us started for the week. After roasting veggies for many months, I have to admit that we were getting bored of them. I needed a simple and nutritious way to liven up roast veggies until spring produce becomes available in our part of the world. 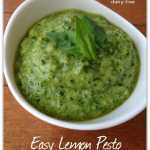 Pesto is a super easy way to jazz up roasted veggies or grilled meat. Pesto is traditionally made with pine-nuts, garlic, fresh basil and olive oil but there are many variations out there. I’ve seen recipes that swap out the basil for different greens like parsley or kale and the pine-nuts are replaced with different nuts and seeds. 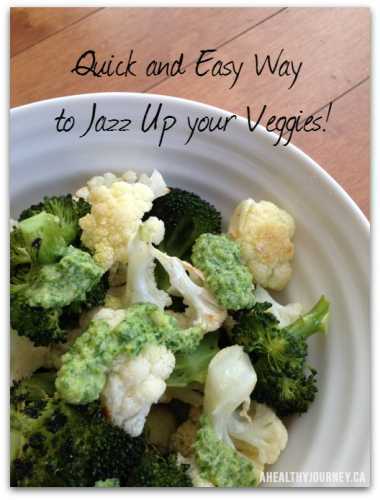 Today I’m going to share with you a recipe for light and zesty pesto served over roasted broccoli and cauliflower. It was a hit at our house and is toddler approved. The next day we spread some on our roast chicken. Divine! Put some out at your next BBQ and your guests will be impressed. The Easy Lemon Pesto with Roast Veggies is one of the recipes from my new Spring Salad Guide. The Spring Salad Guide is a seasonal bonus included in the 21 Day Real Food Reset. 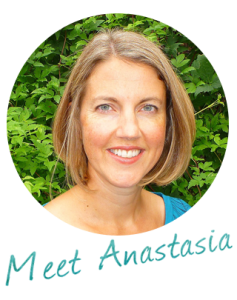 The 21 Day Real Food Reset is all about boosting your energy, ditching nutrition overwhelm and nourishing yourself and your family. You’ll leave this program with a fully stocked kitchen and the skills to prepare simple, nutritious and delicious meals. You don’t need to spend all day in the kitchen to eat healthy if you know all the important short-cuts. The fun starts on April 21st! I invite you to join me for the spring edition of the 21 Day Real Food Reset. Place all of the ingredients in your food processor except for the olive oil. Pour in the olive oil and blend until smooth. If it’s too thick add a little more olive oil. Spoon over roasted cauliflower and broccoli or grilled chicken. This sounds delicious. I love the tang of lemon on just about anything. I have to try this! Camesha, it’s sooo good. Hope you’ve had a chance to try the pesto. I made this a couple of days ago and wow, worth the effort, it is absolutely delicious! I couldn’t resist, I had it with my breakfast this morning! Thanks, a new favorite for sure. Pesto is amazing and really makes your meal a little fancier without much effort. I’ve been trying to embrace more pestos, dips and sauces lately. Glad you liked it!